Since Bethlehem is the most religious place for Christians (next to Jerusalem), they have a large Christian population, and also a Christian University. Half of the students are Muslim though, but that doesn’t seem to bother anyone. The University also seemed well-sustained, and it became clear where they got their money thanks to all the donation signs around the university. The biggest donor (next to private Christian donor organizations) was the Vatican. 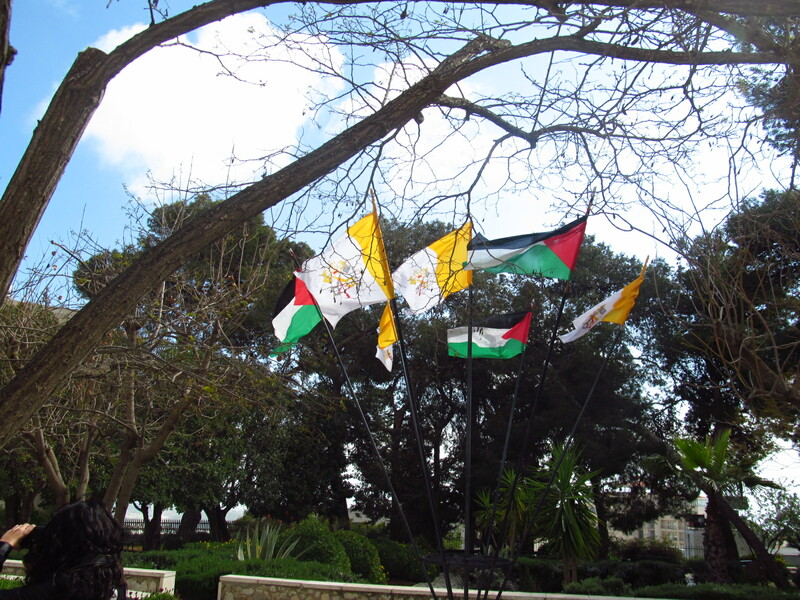 This was literally a university of the Vatican, where the Vatican flag was held up high right next to the Palestinian flag, a very odd combination in my eyes! The visit to Bethlehem Christian University made me realize even more, after 5 days, the enormous complexity of the entire situation. When it comes to who is there, the region has just too many identities all in one. Up until that point I had not even thought about the Christians; they’re there too! And they’re Arab! When we asked how these people would define their identity, one girl said she was first and foremost Palestinian, and then Christian (but Armenian Christian, because you also have orthodox and other stretches of Christianity who are entirely different). She felt Arab, but with Turkish roots. when it comes to bureaucracy, she has a Jordanian Passport to be able to travel outside of the Palestinian Territories, and since she lived in East-Jerusalem, she had a blue IDcard, which is different from the ID card of others living in Bethlehem. If she would ever move from Jerusalem, she would never be able to move back again, so she was willing to travel 4h back and forth through 2 checkpoints everyday to go to Bethlehem University. If she would live temporarily closer to university, she would lose this precious IDcard and ‘privilege’ to live in the East-Jerusalem. A point that I had never thought of, is that Christians and Muslims live peacefully together here (which is so different from European society) because they also share the same culture. They have Arab culture in common, but feel most strongly about being Palestinian. Even though they have a different religion, it does not influence their feeling about each other, which confirmed again for me that this entire conflict isn’t religious. It’s not jews against muslims. It’s about territory. Since we were in Bethlehem, we HAD to see the place where baby Jesus was born of course. The stable where Maria gave birth had a huge church built around it, which was governed by 4 stretches of Christianity (Roman-Katholic, Greek-Orthodox, Armenian and Syrian-Orthodox. The Protestants don’t participate in this public display of Christianity of course…) I thought it was a very unpleasant church since every centimeter of the church was fought over by the 4 stretches, and it showed. It was a chaos of different decoration and was just… kitch! We were also supposed to visit a refugee camp, but did not have enough time for it. We was quite disappointed about that, just because none of us really had a clear image on what it looks like. In the evening we had a visit of Lex Takkenberg, the Chief Ethics advisor of UNRWA (the United Nations Relief and Works Agency) which deals with the Palestinian Refugees. He told us some things about the situation for the Palestinian Refugees, who make up 1/3rd of the Palestinian population. These are people that fled (or as more and more historians also in Israel are starting to recognize; many were forced and chased out of their homes) in 1948 when Israel became independent and the 6-day war started. A lot of them have fled to neighboring countries, but many fled to the West-Bank, and have lived in the camps ever since, and amount to about 5 million by now. What is important to know on how it looks like, is that these tent camps turned into bricks after a while, and the people inside became less dependant on the help of UNRWA, which makes it seem like normal villages. Yet these people are still refugees and have considered their situation as temporary for the last 60 years since they have a right to return under refugee status. This is a very essential point that always comes up in negotiations; what about my right to return? ALL of them are attached to this right, and even though that doesn’t mean all of them will actually return when given the right, it’s a question of principle for all the refugees that their right is respected. Since I had already seen the Al Aqsa mosque, waking up at 4am, I wanted to see the grave church, which was built around the place where Jesus was crucified and died. Some of the group wanted to go to the al Aqsa Mosque in that one hour, but only one girl that wore a headscarf actually got into the site. A mere hour before some jews had come onto the site and had kicked some muslims reading the Quran in the mosque and wrecked havoc. Apparently these are things that happen on a daily/weekly basis. I don’t know how much is true of the frequency, but the authenticity of what had happened that day checked out, with many different witnesses, which really baffled me. 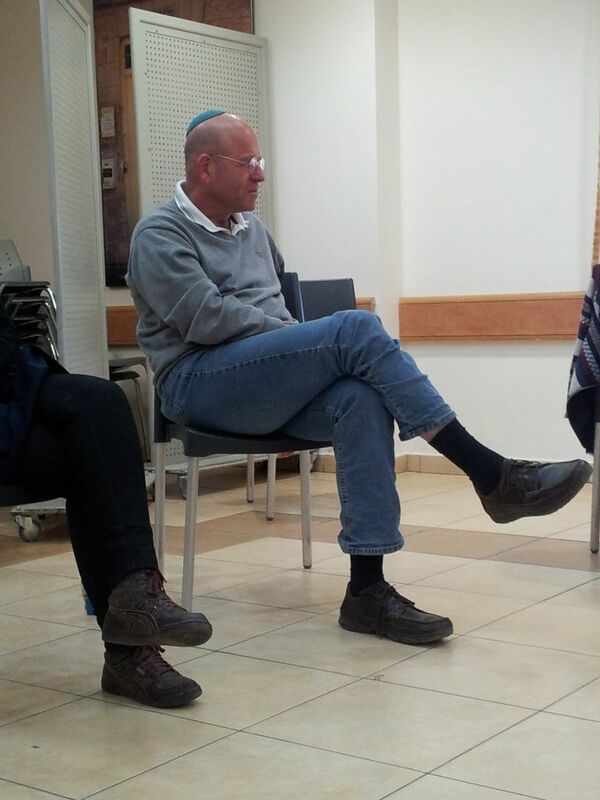 Anyway, we had the very special occasion to meet up with Avraham Burg, the former chairman of the Knesset, who decided to leave politics when he realized how disgusted he was by all of it, and started writing books. We read his book “the holocaust is over, we must rise from its ashes” to prepare for the trip, in which he describes how sick and tired he is of Israelites defining their entire identity by claiming victimhood as holocaust survivors. Yes, the holocaust was bad, but how the holocaust is manipulated now for political purposes cheapens the memory according to him. He reflected the same feeling over what I had written about Yad Vashem (the holocaust memorial/museum). He also pointed out this little detail that everything in Israel is written in 3 languages (Hebrew, Arab and English) except in Yad Vashem. Arab is left out of the museum, because the Holocaust isn’t meant for Arabs. The Israeli don’t want to share the universal experience of suffering, but of JEWISH suffering according to Avraham Burg. This was also the reason he claimed jews don’t seem to care about the Palestinian suffering; they’ve become so ethically traumatized that no suffering is comparable to their suffering. He does however refuse to hear any comparison of the holocaust with the Palestinian suffering, and I can agree on that now. Regardless of how bad both are, the Israeli are not deliberately exterminating Palestinians, they just don’t care about their request for justice. Many more things were said, and he was a very inspirational speaker, who unfortunately doesn’t want to go back into politics right now, since he claims there’s no political climate for his views right now. He does see a future in ending the conflict where arabs keep making non-violent resistance, opposing the occupation, since Israel has no clue how to deal with it. In the afternoon we went to Hebron, one of the more conservative regions of the Palestinian territories, which we did feel when having lunch outside. Our very diverse group drew curious eyes again and I did not see one woman without a headscarf. We were welcomed at the Hebron University by a huge number of students, and had to sit in groups of 15 students to talk. The groups would rotate every 15 minutes. It really tired me, and I was quite done talking about the conflict in superficial, and yet very “In your face” direct ways, with a small introduction immediately followed by “so what do you think of the conflict and Palestinians?” How do you reply to that in a balanced way in less than 15 minutes? I tried to have discussions with some students about other things than the conflict, but it turned out to be a difficult task, since EVERY aspect of their life is influenced by it. “so, do you like movies? – yeah I do, but the electricity is cut often so it’s hard to see a movie in full”… sigh. After that we had some explanation by TIPH (the Temporary International Presence in Hebron, an organization that only has an observational role to report back to the government of the 6 European countries involved what was happening there) about Hebron and the Jewish presence there. Hebron is special because the settlers came to live right in the center of the city. Their Arab neighbors had to move for safety reasons of course, and a lot of the streets surrounding the settlements were turned in ‘demilitarized zones’. The city has a great significance both for Jews and for Arabs, which makes it, like Jerusalem, a tug of war who gets to own the city. a couple a years ago Baruch Goldstein, one of the more crazy settlers, entered the mosque and shot somewhat 27 muslims praying. He is considered a martyr for the settlers in Hebron and a hero. The thought that the soft carpet on which I was standing barefooted was once blood soaked really nauseated me. We walked around a bit in the ghost town part of the center that wasn’t inhabited by anyone (‘safety zone’). It totally felt like a war zone, and we discovered our Palestinian guide would not be able to be there if he wouldn’t be guiding us. When approaching the entry to a settlement, he couldn’t even walk with us anymore. 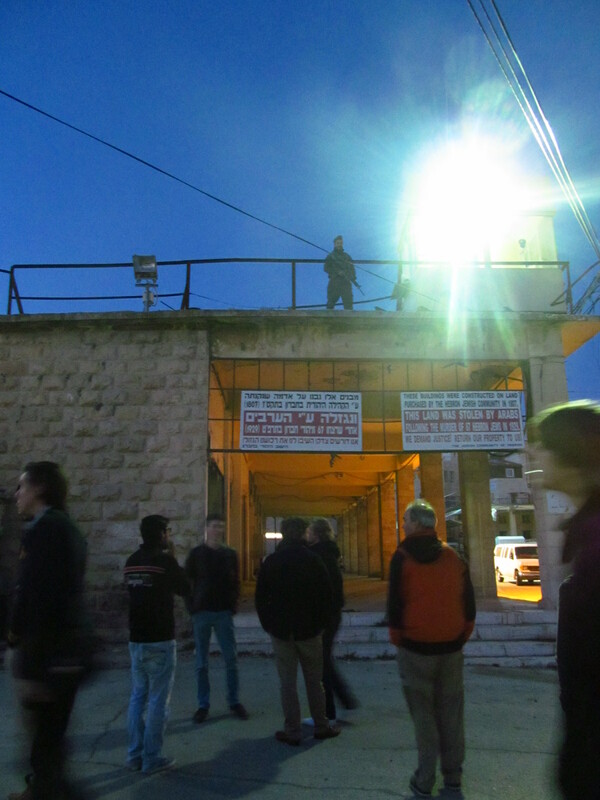 A soldier on a roof shouted at us “DO YOU LOVE ISRAEL? ?” with his rifle in his arms and an smug smile on his face, leaving almost all of us speechless. A settler woman at a busstop shouted something in Hebrew at the soldier, we figured it was something like “don’t talk to them, they’re arab”. We left when darkness started closing in on us. There were 2 little souvenir shops in the abandoned ‘safety zone’ street, a presence that couldn’t have felt more surreal. We were truly the epithomy of a disaster tourist.